The Insta Inspirations #2 - My Liked Posts! Liv from WhatOliviaDid has had a fair few mentions already on Charlotte's Web so I won't ramble for too long about my total girl crush for her. 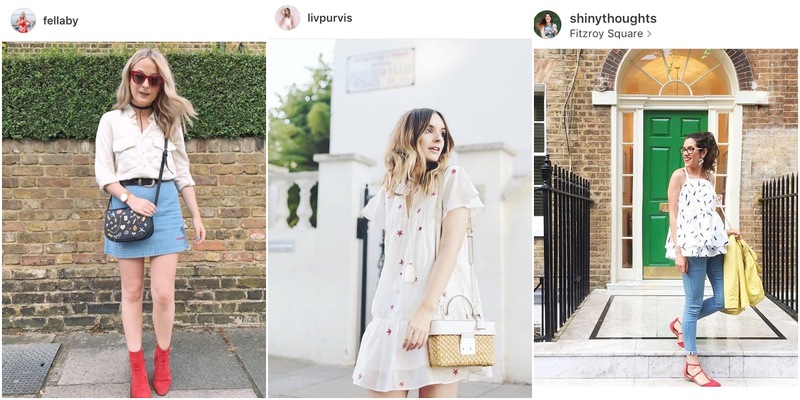 I really loved the star print number in one of her recent Instagrams; I feel like mine and Liv's style is so similar in terms of floaty, smock dresses and dressing slightly like a small child so I'm always stalking her social media when I'm need of some inspiration. I love the drop waist and tassels on this dress and really what is there to say about THAT Michael Kors Gabriella satchel. I NEED ONE. Next up is Lucy from the blog ShinyThoughts whose Instagram I obsess over daily for colourful outfits, colourful food and well, colourful everything really! I had planned to do this post for a while and so have been screen grabbing outfits as I go, and this was one I was one I've been head over heels with for a long time! I really love the tiered top she's rocking and the confetti pattern is right up my street and works perfectly with her statement earings another thing I think are part of Lucy's signature style! I'm not really a skinny jeans wearer but the light wash paired with the bright red accents of her shoes work so beautifully together. I think I need to go jeans shopping. 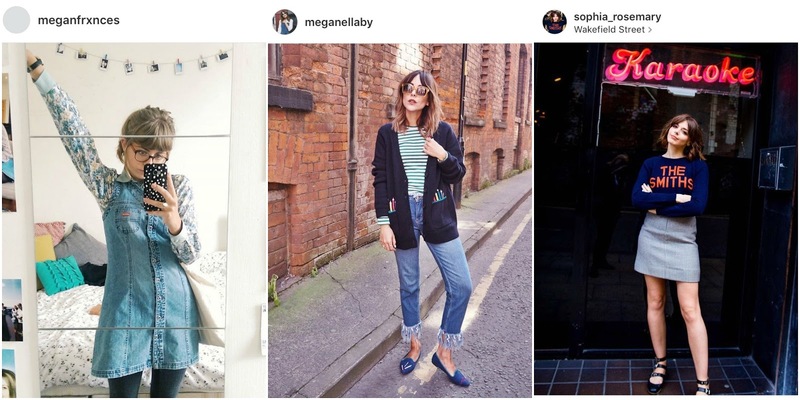 I haven't followed Megan for too long online but her super cute style suits her arty personality down to a tee! This denim pinafore dress is SO BLOOMIN' CUTE and paired with the almost pastel floral shirt, gives the look a very cool toned vibe; perfect for the transition into A/W! I'm also obsessed with tote bags at the moment so seeing her rock one with a really casual look has reminded me I was on the look out for another funky one; send recommendations please! Another Megan next! I think I might have mentioned Megan Ellaby in my last Insta Inspo post which only goes to show how utterly obsessed I am with her style. Seriously I don't think there's anything she's worn in the years I've followed her that I haven't liked. Not only do I adore the laid back stripes and cardie vibes of this look (total primary school teacher but cool vibes) but I'm so IN LOVE with those tassel jeans! Like I said I'm not usually one for jeans but as I'm moving back up north in a couple of weeks and with September just around the corner, perhaps finding the perfect pair is a wardrobe edition I can totally justify. And finally, super cool Sophia is my last fashion inspiration of late. I love the contrast within her style and how she channels both quite grungey looks as well as super girly smock dresses, which as I mentioned earlier I am all about! I saw Liv (mentioned earlier) rocking the same The Smiths jumper on her blog a couple of months back and my love for it has been fully cemented when seeing Sophia style it so wonderfully. Despite my mention of autumn about 200 times in this post, the mini skirt she's rocking has got me pining for summer to stay around a little longer so I can get away with the bare leg and skirt combo for a few more weeks pls?? So that's it! Another instagram post rounded up and done! I'd love to know who inspires your style via social media so whether it be Instagram, Twitter or blogs, send me links in the comments and let's share some love for those gals whose style we just can't get enough of.